Yaltiza Aparicio has served up a lot of great looks for her first awards season. Her stylist Sophie Lopez posted to her instagram page today(February 1st) her most recent look. She posed for the gram wearing a gold ALFREDO MARTINEZ FALL 2018 long sleeve velvet dress, which was belted at the waist, and featured padded shoulders, and a draped pleated panel. While the brooch isn't extremely missed, I do wish she kept it. The dress makes more of an impact on the runway but it fits Yalitza nicely. However if I had to change anything, it would be those black NICHOLAS KIRKWOOD pumps, for an metallic ankle strap heel. Although, the matching boots works so much better on the runway but I don't think Yalitza could have pulled it off. DEAN DAVIDSON earrings, red lips and a ponytail rounded out her look. 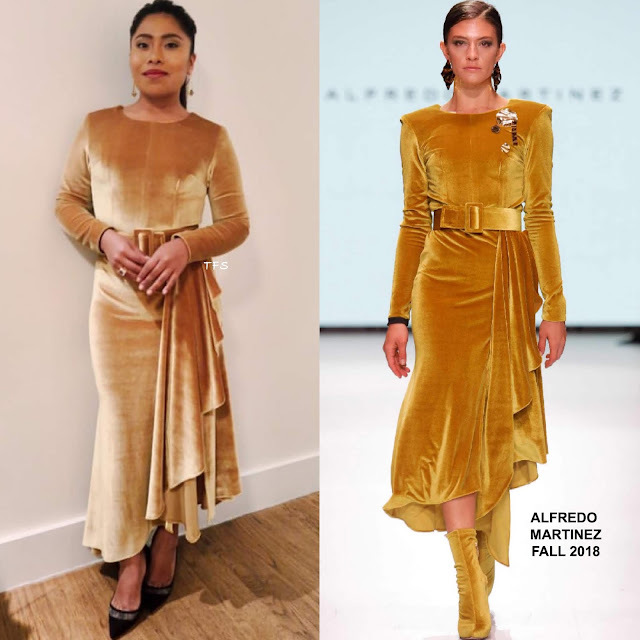 What do you think of Yalitza's instagram style?